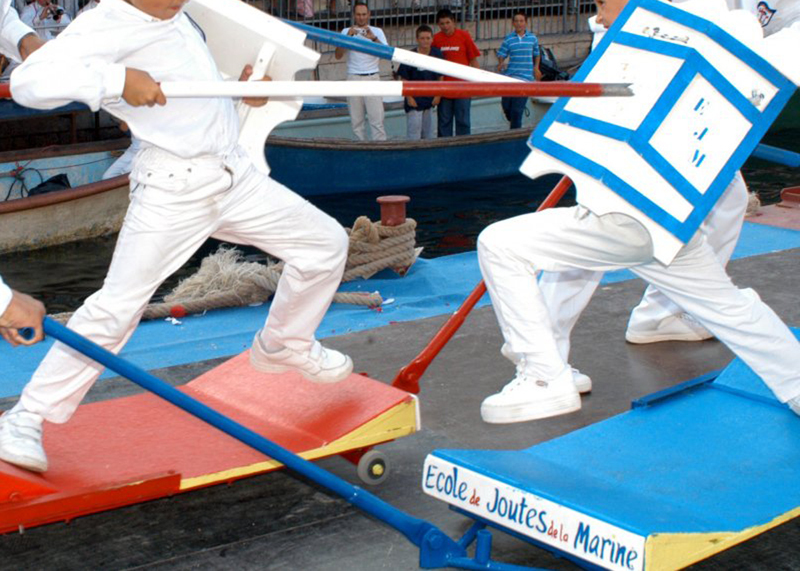 More than a sport, much more than simple folklore or tradition, jousting reflects the very soul of Sète's inhabitants! Water jousting is a Languedoc tradition dating back to the eighteenth century: the first jousting competitions took place in several Languedoc villages: in 1601 in Agde, then in 1627 in Frontignan, and then in 1665 in Mèze. 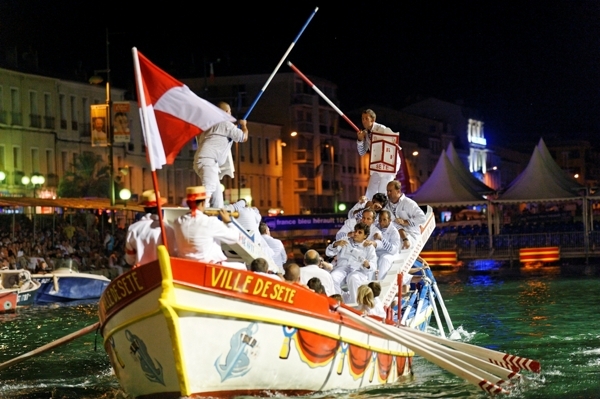 In Sète, the first water jousting tournament took place on the 29th July 1666, to celebrate the foundation of the port which was deeply linked to the digging of the Canal du Midi. In the eighteenth century jousting tournaments opposed young bachelors in a blue boat to married men, in a red boat. 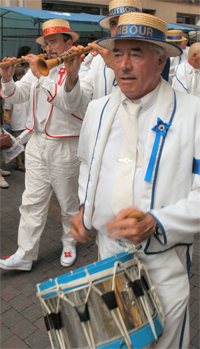 Their pole, shield and uniform are decorated accordingly. Jousters belonged to various districts. Today, jousting is still a strong and lively traditional activity. Before the tournament begins the jousters parade accompanied by an oboist and a drummer playing the traditional jousting tune. The music encourages the jousters and oarsmen while jousting. A first pass of honour opens the tournament. The jousters shake hands holding their spears vertically when their boats cross. Then perched on the boat platform ("tintaine"), their chest protected by their shield, they prod their opponent with an iron tipped wooden spear, with the aim of making their opponent fall over board. These battles have strict rules and disqualification is immediate if they are not respected. During the Saint Louis festival, you will admire, from the stands alongside Royal Canal quay, an oustanding water jousting tournament. Since 1666, the winner's name is engraved for posterity on a shield, in the Paul Valéry Museum’s jousting room. The boats are propelled by ten oarsmen, mostly fishermen, with an experienced boat captain at the helm. At the bow of the boats, an oboist and a drummer play the traditional jousting tune just as the two jousters encounter each other for combat. 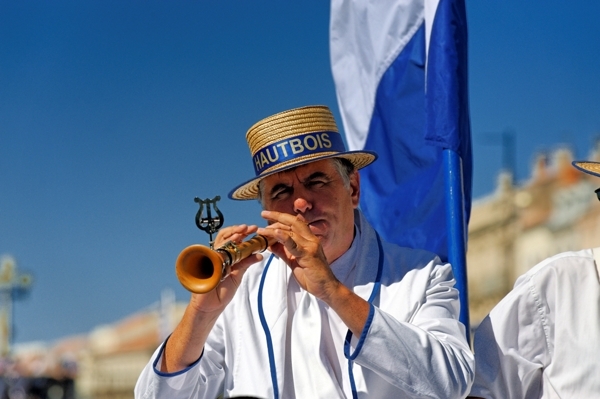 They also play traditional Languedoc tunes between passes. A brass band sitting in the stands gets the fans going and salutes the victories and the more spectacular passes with trumpets blaring! "Tintaine": is a small platform about 2 meters above the water level where the jouster stands. 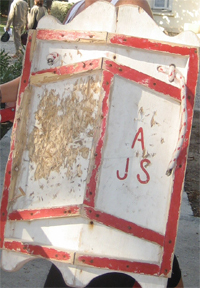 "Pavois": wooden shield, protecting the jouster's chest. "Lance" : a 2.80 metre long pole made of various kinds of wood. According to the town: a Sète jousters' pole is made of wood from the North; a Mèze jousters' one is made out of red wood. The jouster holds his lance firmly and tries to knock down his opponent into the water. The tip of each pole is fitted with a triple steel point.